Major League Baseball is celebrating the 12th anniversary of its live video streaming offering on Tuesday. But it will be baseball fans celebrating next season if the league’s online arm follows through on a promise to ease blackout restrictions on local games. That’s the word from Bob Bowman, chief executive of Major League Baseball Advanced Media, who indicated in an Associated Press interview last week that blackout restrictions on streaming local games could be relaxed as early as the 2015 season. According to Bowman, MLB is making progress hashing out a deal with baseball clubs, TV channels and cable operators. That’s welcome news to subscribers to MLB.TV, which offers live broadcasts of games through your computer, mobile device, gaming console, or set-top box. Currently, subscribers can watch nearly every baseball game through MLB.TV—except when it involves their local team. If you live in the San Francisco Bay Area, for example, you can’t watch Oakland Athletics games on MLB.TV—even if the A’s are playing in another city and the game isn’t even being broadcast on local television. That’s long been a sore spot for MLB.TV subscribers, and it’s one Bowman and Major League Baseball Advanced Media seem eager to address. There are a couple of catches, though. To be able to access streams of local games, viewers will have to also subscribe to the regional sports TV network that carries them on cable or satellite. That means cord cutters will still be left out in the cold even if local games become available through MLB.TV. Another wrinkle: the baseball analytics site Fangraphs says that the plan being hatched by MLB Advanced Media wouldn’t help fans who live in a team’s exclusive broadcast territory but don’t have access to games on a regional sports network. A fan in Las Vegas, for example, is blacked out from games involving the Los Angeles Dodgers, Los Angeles Angels, San Diego Padres, Oakland A’s, San Francisco Giants, and Arizona Diamondbacks; if lifting blackouts requires a subscription to those teams’ regional sports networks, the restrictions would seemingly remain in place for that poor fan in Vegas. That said, MLB Advanced Media has slowly been chipping away at blackout rules. The All-Star Game was streamed live on MLB.TV for the first time this summer, and subscribers will also be able to watch live World Series games as well as some playoff games this fall. And MLB.TV axed the much-loathed national broadcast window for Saturday games, meaning you’re not restricted to only watching the game airing on your local Fox affiliate. As for MLB.TV’s 12th anniversary, it was August 26, 2002, when MLB.TV showed a live stream of a New York Yankees-Texas Rangers game in a postage-stamp sized media player. 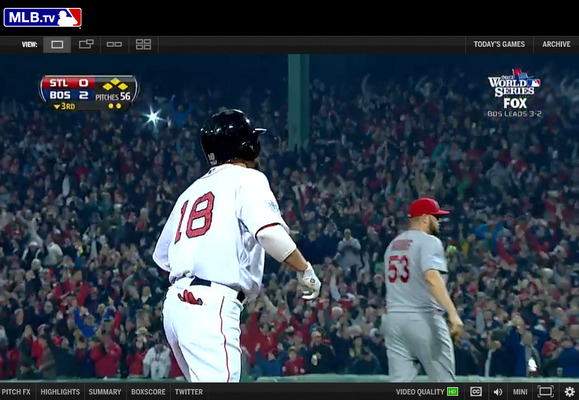 To mark the occasion, MLB.TV subscriptions are available for $12 until 11:59 p.m. ET Tuesday.